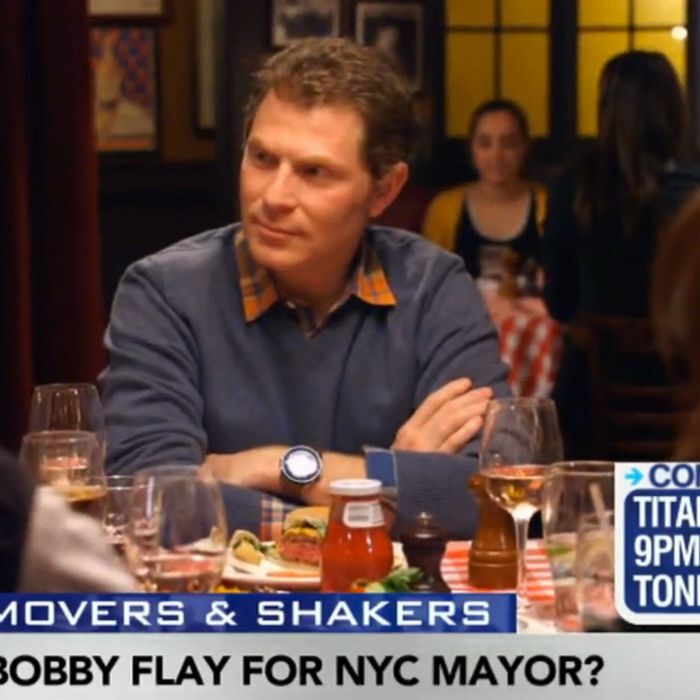 Does Bobby Flay want to eventually be the mayor of New York? Bloomberg’s Betty Liu asks the celebrity chef flat-out on tonight’s Titans at the Table, in the company of fellow TV hosts Rachael Ray, Mario Batali, and Tom Colicchio, who each talk about their careers. “That’s a rumor,” the Mesa Grill and Bolo owner is quick to respond. “That’s a rumor. I’m proud to be a native New Yorker, and I love New York so much. It’s been a wonderful place for me to live and a wonderful stage to be on.” So, is that a yes? “I’m really passionate about New York,” Flay continues, adding that others have suggested a mayoral run, but he’s not so sure just yet. “I don’t know what position that would be.” Batali and Colicchio, it should be noted, look visibly concerned for their friend. Titans at the Table airs tonight on Bloomberg Television. In the meantime, it’s never too early to start producing those “Flay 2017” stickers.